APM Terminals (APMT) recedes from selling its port facilities at Pipavav and Jawaharlal Nehru Port Trust (JNPT) in India, writes The Hindu BusinessLine quoting top executives at two local companies who participated in the bidding process. “We looked at the two facilities for a potential acquisition. But, APM Terminals decided to put it on hold,” said BVJK Sharma, Joint Managing Director and Chief Executive Officer of JSW Infrastructure Ltd.
“We did due diligence of the two facilities. However, APM Terminals withdrew from the process without assigning any reasons,” said Rajiv Agarwal, Chief Executive Officer of Essar Ports Ltd.
As we wrote earlier, the talks about APMT’s intention to exit the Indian container terminal market started leaking earlier this year. Although APMT never openly confirmed that, the move would be seen in line with its updated strategy to focus on long term core assets. Adani Group and its port operating company Adani Ports and Special Economic Zone Ltd, India’s biggest private port operating company, was the third bidder for the two facilities. The sale process was managed by HSBC. According to Indian port industry sources, the deal was hindered by regulatory problems. APMT holding a 43% stake in Gujarat Pipavav Port Ltd can run the port only during 10 years more, because its 30-year concession agreement for the facility ends in 2028. Uncertainty over extension of the concession beyond 2028 was a concern for the bidders. The Gujarat Maritime Board, the agency that supervises the ports owned by the State government, has indicated that Pipavav could be re-auctioned in 2028, after the concession period ends. It implies that the concession agreement would not be automatically renewed, but the port would be put on auction, with many bidders looking to grab this well-developed facility. 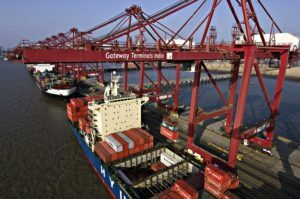 Gateway Terminals India (GTI) at JNPT, where APMT has 74%, is India’s single biggest container terminal by volumes, accounting for about 45% of JNPT’s total container throughput and approximately 20% of India’s total container traffic. During the 11 years of operations, GTI has been subjected to two rounds of rate cuts by the Tariff Authority for Major Ports (TAMP). In March 2010, TAMP reduced rates by 10% and later on, in February 2012, there followed a much steeper cut of 44.28%. However, the Mumbai High Court postponed this 2012 rate cut on a petition filed by GTI, allowing the terminal to charge the rates effective prior to the reduction till the case is decided. If GTI loses the case, it will have to refund over 1,500 crore (about USD 232 mln) to customers as excess collected since February 2012.